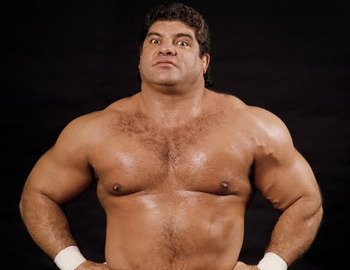 Don Muraco was the average 80s WWF villain. He was booed because fans were told he was evil. He partnered up with The Grand Wizard and Mr. Fuji to show just have evil he was. In the 1970s and 1980s, managers were used to get people over. The manager was in many cases more important. Don Muraco fits into that category. He did hold the WWF IC title twice (back when it meant a lot) because he fit into a mold. He was big, burly and physically imposing. Still, he was a sloppy wrestler. The IC title in the 80s was generally given to the best wrestler. Pedro Morales, Tito Santana, and Randy Savage all fit this mold. Not Don Muraco. Still there were positives to him, which is why we remember him. Once he was partnered with Mr. Fuji , he took on a slightly comedic role. See the Fuji Vice above. (Not Monty Python funny, more Bad TV Show funny) Still though, Muraco was defined by his manager throughout his career. Even his famous match with Jimmy Snuka occurred because his manager, Captain Lou, was feuding with Jimmy Snuka. Muraco is memorable for his title reign and a fine addition but not a necessary addition to the Hall. 2004 was the rebirth of the Hall of Fame. And the E went balls to the wall. All the inductees were the well known and respected wrestlers, managers and talent from the late 70s and early 80s. It was an amazing class except for Pete Rose. And Don Muraco. There is a rumor that Bob Backlund was invited to be inducted in 2004 and declined due to believing his had another run in him. Backlund is crazy after all. Muraco is a fill in candidate. 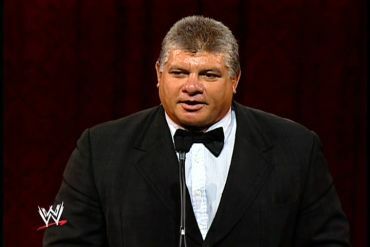 Even during Foley’s induction speech, he talked more about the match with Jimmy Snuka than anything else. Its Muraco’s moment. Generic Heel Types of the 1970s and 1980s. If Crush gets in, you know why. He’s not very good. See Below. Holy Crow! He can eat a sandwhich and it gives him the energy to barely do a weird back breaker-piledriver! Beach Bum!!!! This entry was posted in 5 out of 10, Class of 2004, WWE Hall of Fame. Bookmark the permalink.